Interview with Maria Albo conducted Aug. 18, 2013. On Nov. 22, 1963 Phil Albo learned, along with the rest of the nation, that President John F. Kennedy was assassinated in Dallas, TX. The news shook the Trinidad construction worker, and part-time musician to his core, and in his grief, he picked up his guitar, and put his thoughts on paper. “He sent that single to Jackie, Ted, and Bobby, and he received the nicest letter from them, thanking them for the record,” she said. 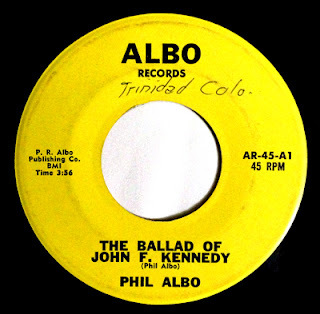 Albo had been a fixture around the Trinidad music scene, playing guitar in Freddie Baca’s band at the local bar, El Rancho. Maria thought the back-up musicians on the single were from Freddie's group. The single doesn’t provide any additional information beyond the title, singer and publishing information. A search on the Catalog of Copyright Entries shows the song was entered on Dec. 27, 1963. Maria says Phil died of leukemia a few years after that recording.